Velvet Ants (Dasymutilla spp.) may be velvety looking, but these large, fuzzy insects are not ants. Velvet Ants are actually wasps, and more than three dozen species of them are found here in the Sonoran Desert. The females are wingless and look like large ants. The winged males look quite different from the flightless females and are rarely seen. I observed this female Velvet Ant zigzagging up a trail in Molino Canyon near Tucson late one September afternoon. She was busily investigating small holes in the ground, probably looking for the nest burrows of other solitary wasps or bees in which to lay her eggs. After they hatch, the Velvet Ant larvae will then feed on the wasp or bee larvae and pupae in the host burrow. 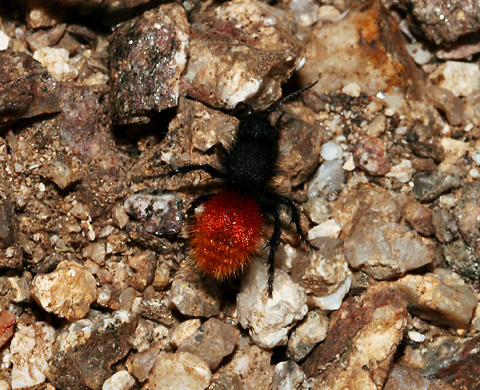 The various species of reddish orange and black Velvet Ant are the most common here (and thus harder to identify), but some of our species do come in other colors like the yellow Satan’s Velvet Ant (Dasymutilla satanas) or the white Glorious or Thistledown Velvet Ant (Dasymutilla gloriosa). The bold black and orange colors of this Velvet Ant are a form of aposematic coloration, a warning to potential predators that it should be avoided. 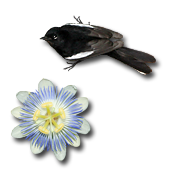 Orange and black are common warning colors used by many insect species. Velvet Ants are not aggressive and will try their best to avoid humans and other creatures, but if picked up or handled by a foolish human or predator, a Velvet Ant will sting it repeatedly as a form of self-defense. The sting of a Velvet Ant is very painful, a 3 out of a possible 4 on the Schmidt Sting Pain Index. As a comparison, on this scale, a Honeybee (Apis mellifera) is a 2 out of 4 and a Tarantula Hawk (Pepsis sp.) is a 4 out of 4.